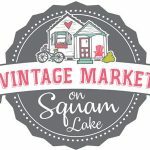 A sensational and tasty New Hampshire Fall Foliage Event is Vintage Market on Squam Lake at Cottage Place on Squam. Why not spend the week? Browse Vintage Wares, Local Artisans, Gifts, Upcycling, Pink Elephants, Salvaged Treasures. Delicious Food Trucks. Free Admission. A great reason to visit the beautiful Squam Lakes region of Holderness, NH.